The Senna vs. Massa matchup was another close one, but towards the end of the voting time, it became obvious that at least one Brazilian was going to get through. Ha! On to more serious business now, it's time for another Character Cup hopeful to take on the might that is Karun Chandhok. Karun's route to the second round saw him barely stop to draw breath, as Jarno Trulli couldn't put up much of a fight against the HRT driver. Chandhok almost reached 200 votes, whilst Jarno picked up just 26. 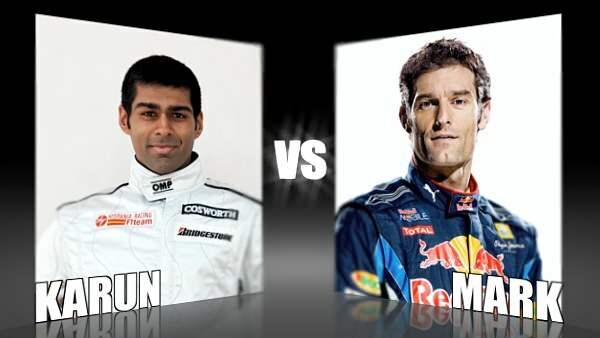 I wonder if Webber will be able to put up more of a resistance or if it will be Karun all the way to the semi-finals. Webber is busy battling with his teammate in the championship, hoping for wins against the sister Red Bull. It's tense times in the garages at the moment, as the two of them try to work together but beat each other as well. In the Character Cup, though, Mark's had a good ride so far. He's seen off competition from Kubica in round 1, but now, it's all about Chandhok. Where will your vote rest?